[Source: Phoenix Magazine] 33 Neighborhoods We Love. We're Green with Envy over these Eco-Friendly homes, which combine sustainability with modern amenities. This community is the first development in Arizona to receive Leadership in Energy and Environmental Design (LEED) for homes certification. LEED promotes sustainability by evaluating performance in five key areas of human and environmental health, including sustainable site development, water savings, energy efficiency, materials selection and indoor environmental/air quality. These eight detached residences in the Biltmore area are a few walkable blocks from amenities at 24th Street and Camelback, including Bilmore Fashion Park and Esplanade Shopping Center. Each two-story residence is nearly 2,000 square feet. [Source: Phoenix Business Journal] Green building experts from around the world converged on Phoenix this week for Greenbuild International Conference and Expo, where they got to hear from some of the leading voices for greening of housing in America at the event's Residential Summit. Despite all of the fanfare, Phoenix is not a wellspring for sustainable housing. Of 3,089 housing units certified nationwide under the USGBC's Leadership and Environmental Design program, only 15 are in the valley. LEED is the most universally accepted measurement of the energy efficiency and sustainability of buildings and neigborhoods. Eight of the Valley's 15 LEED-certified units are part of the upscale Galleries at Turney, a sleekly designed community developed by Ed Gorman, founder of Modus Development, and designed by merz project architects. Located in a traditional neighborhood of modest ranch houses south of Biltmore Fashion Park, the community has become an internationally acclaimed example of contemporary design intersecting sustainability. [Note: to read the full article click here]. [Source: Arizona Republic - Home] People who are looking to buy home now want them to be green - not only eco-friendly green, but economically green. "Saving money is the Number 1 thing when it comes to green," says Ed Gorman, founder of Modus Development, which built Galleries at Turney, an "urban green" development in central Phoenix. More than low-VOC paints and how the wood is engineered - and way above saving water - it's money." At The Galleries at Turney, the utility bill for a 2,000-square foot home is about $125 in the middle of summer. "That's what gets people's attention," he says. "I firmly believe that in five years everything built will have to be green, whether LEED or some other standard. What will drive it? Whether demand by consumer or required by the government, some source will have to make it." This urban oasis of eight homes by Modus Development is the first community in Arizona to be LEED certified. LEED stands for Leadership in Energy and Environmental Design and is a national benchmark of standards for eco-friendly building. One of the most striking aspects is the exterior. The houses are covered in corrugated zinc that's suspended off the walls by an inch, which lets hot air flow behind it and continuously shades the building, Gorman says, adding, "Architects come from around the world to see it." The roof includes a reflective coating to keep it cool. The homes were built on a plot of land that used to include two-single family houses. With desert landscaping, controlled irrigation and other water-saving features, Gorman estimates the eight homes use less water than the two houses that were there before. [Source: GreenSource Magazine] -- The Anti-Tract Houses: A developer blends the single-family home mentality of old Phoenix with the urban density of the row house to create a new southwestern sensibility. 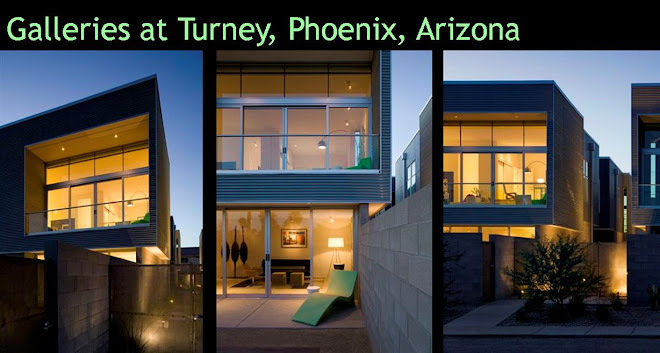 The Galleries at Turney enjoy the distinction of being the first LEED for Homes Certified project in Arizona. However, this eight-unit development would turn the heads of even the most eco-oblivious passers-by. In a central Phoenix neighborhood of low-slung, sun-parched mid-century ranches -- what historian Colin Rowe called “ranchburgers” -- and some brand-new spec-developer Styrofoam villas, the Galleries are unapologetically, refreshingly, non-contextual.